Returns the float8 minimum bounding box for the supplied geometry, as a geometry. The polygon is defined by the corner points of the bounding box ((MINX, MINY), (MINX, MAXY), (MAXX, MAXY), (MAXX, MINY), (MINX, MINY)). (PostGIS will add a ZMIN/ZMAX coordinate as well). Degenerate cases (vertical lines, points) will return a geometry of lower dimension than POLYGON, ie. 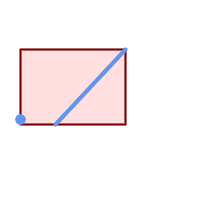 POINT or LINESTRING. Envelope of a point and linestring.